Inspired by the styles and beauty of Cape Cod, Massachusetts, the Amish Cape Cod Pine Kitchen Cupboard truly has it all! This spectacular solid wood cupboard offers an attractive collection of shelves, drawers and cabinets for you to enjoy. Supplying useful and stylish storage, this is a pine cupboard that can be used in your kitchen, office, living room or family room. With room for everything from dishes and utensils to books and artwork, this lovely Amish cupboard will quickly become a family favorite. The Cape Cod is handcrafted by the Amish and is carefully assembled with screws instead of nails for a longer lasting, stronger and more durable kitchen cupboard. Be sure to take a look at the matching Amish Cape Cod Pine Pantry Cabinet to use with this pine cupboard. 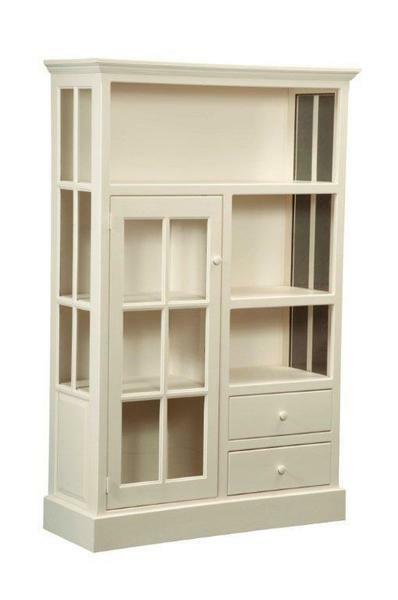 The Cape Cod Pine Kitchen Cupboard is made with solid eastern white pine. Pine wood is lightweight and is yellowish or whitish in color and resists shrinking and swelling. A softer but stable wood, pine adds a charm that can't be beat to your American home furniture collection. The price is always right with pine, as it offers a more economical choice among premium solid hardwoods. Everything arrived perfectly. The furniture is beautiful and expertly made. Each piece fits wonderfully and all better than expected.